Winnimere season starts.....Right now! 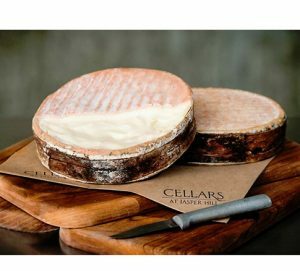 - Zuercher & Co.
Quite possibly Jasper Hill’s most celebrated cheese, Winnimere is one of the few soft, washed rind, raw milk cheeses made in the United States. It is coveted whenever seasonally available…..which is now! Winnimere pays homage to Vacherin Mont d’Or of the Jura Mountain region by using hay-fed winter milk. The wheels are wrapped in strips of evergreen bark, washed in brine and aged in Jasper Hill’s cellars for a period of 60 days. The indigenous microflora present in the unpasteurized milk and aging cellars produces optimal results. Winnimere’s paste is wonderfully gooey and is best served when a bit of the rind is peeled back and the interior is scooped with a spoon. When left to temper out of refrigeration for about 30 minutes, you will begin to notice flavors of sweet cream, bacon and spruce.